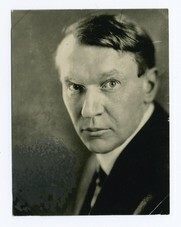 Of the many artists and poets who have celebrated the life of John Chapman, Vachel Lindsay is perhaps my favorite. Lindsay at times appeared to aspire to be a twentieth-century version of Johnny Appleseed. He set off on several “tramping expeditions” across the nation with little money in his pocket, eager to meet ordinary Americans, and swap poems for food and shelter. Lindsay combined a deep patriotism with a concern for the poor and dispossessed. He voted the socialist ticket, embraced pacifism, and had utopian dreams for his nation. 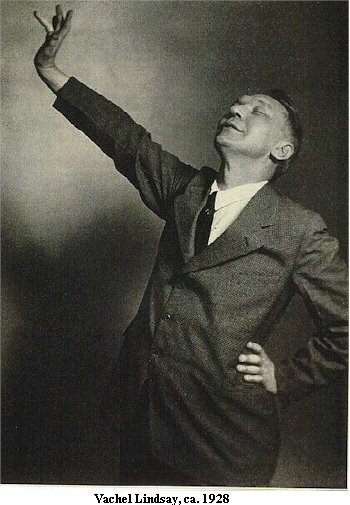 Traveling across the nation, he gave recitals of his poetry in a frantic, populist style he called “High Vaudeville,” and many of his poems were choreographed and danced. 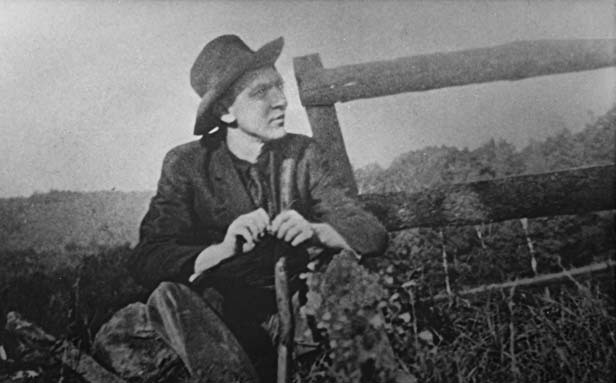 Although there are some surviving recordings of Vachel Lindsay performing his poetry, I am not aware of any recordings of his performance of “In Praise of Johnny Appleseed.” Lindsay cared deeply about how his poems were read, and sometimes offered his readers puzzling instructions on how to read them. In the introduction to his Collected Works, Lindsay instructed: “All my verses marked to read aloud should be whispered, however contradictory that may seem. All poetry is, first and last, for the inner ear, and its final pleasures are for the soul, whispering in solitude.” I confess to taking this advice literally. But when I read “In Praise of Johnny Appleseed,” the whisper that leaves my lips is a glorious shouting in my head. One last note: Vachel Lindsay included italicized instructions on how to hear this poem along the margins of the text. I have included these odd little instructions in brackets and italics, as close to their location in the original printing as I could. 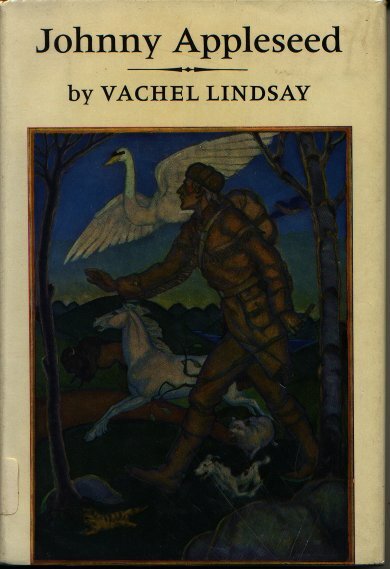 Vachel Lindsay on a tramping expedition. He often swapped poems for food and a place to sleep..
Feasting in the dim, volunteer farms of the forest. 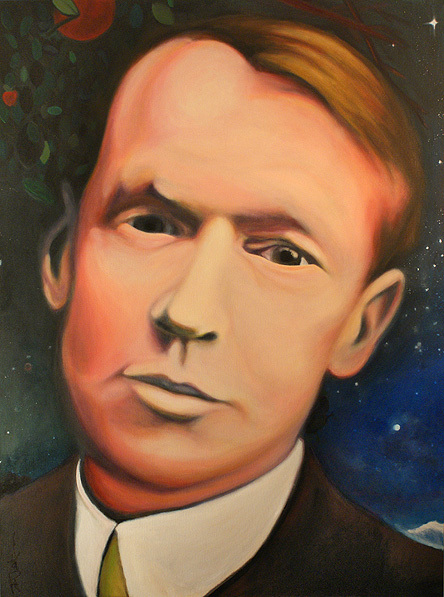 Painting of Vachel Lindsay by artist Ted Keylon. Of the foggy mazy forest. Lindsay gesturing dramatically during a reading. Of the Ancient of Days. In the name of the Ancient of Days. 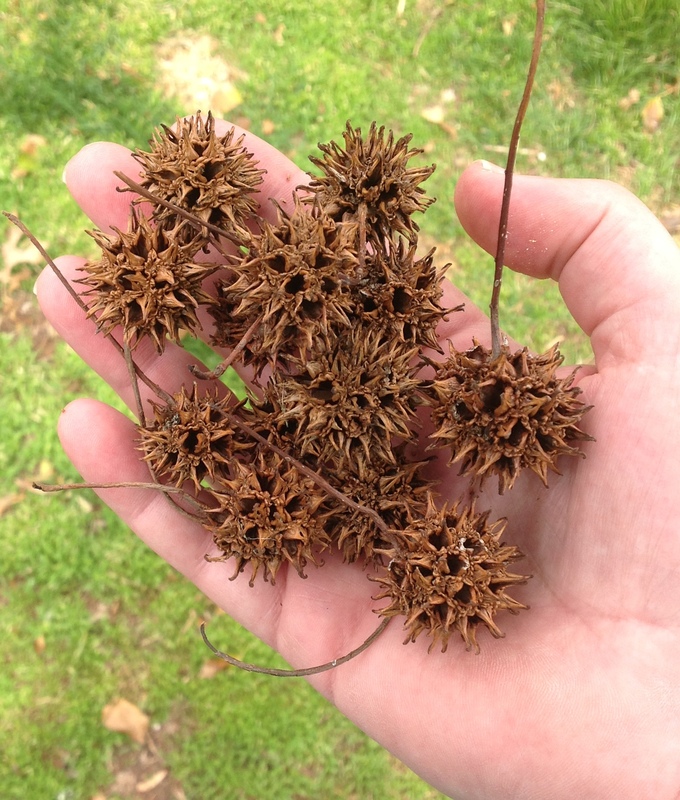 To guard each planted seed and seedling. Stuck holy feathers in his hair. Hailed him with austere delight. The orchard god was their guest through the night. In swept the snowbirds singing glory. And the ghosts of the tom-toms beating, beating. But he left their wigwams and their love. 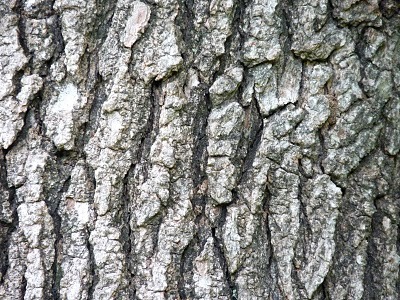 Sleep in the trees, while the years howled by. And buffalo bulls no hand could tame. 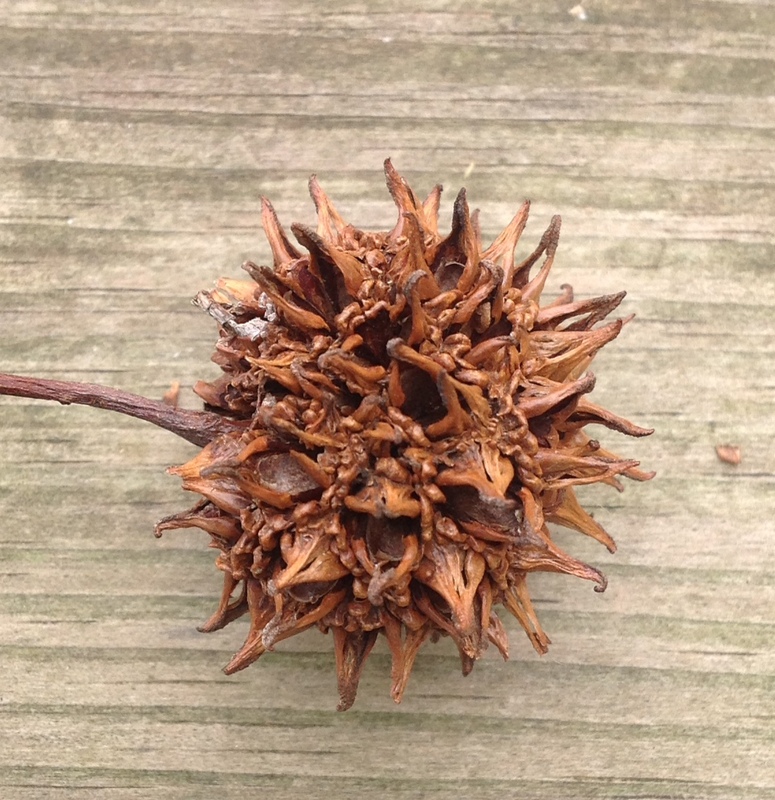 Called to his seeds without a sound. And he ran with the rabbit and slept with the stream. In the days of President Washington. They asked of the birds: “Who gave this fruit? Who watched this fence till the seeds took root? More sane than the helm of Tamerlane! Hairy Ainu, wild man of Borneo, Robinson Crusoe—Johnny Appleseed! Still planted on in the woods alone. Where still he burnt out flesh and bone. At last his own trees overtook him, at last his own trees hurried past him. And the real frontier was his sunburnt breast. Love’s orchards climbed to the heavens of the West. And snowed the earthly sod with flowers. And swam once more the ice-cold streams. 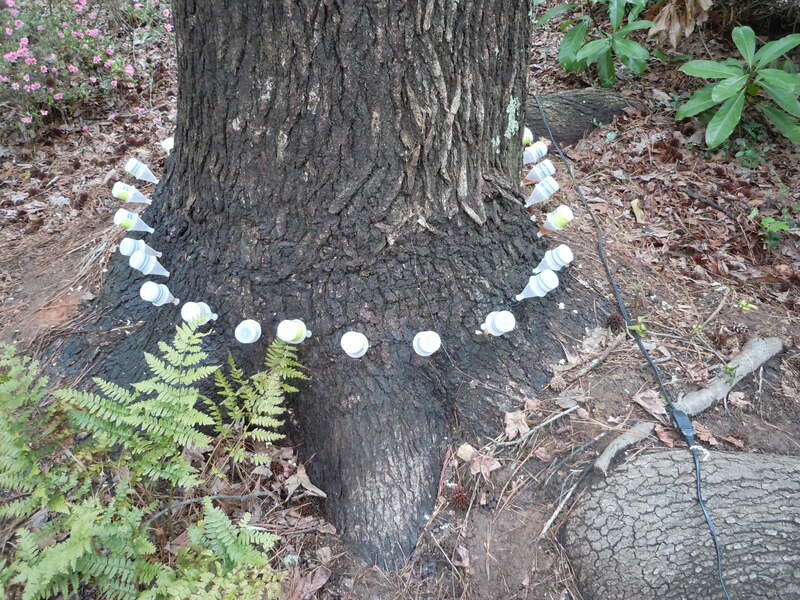 That touched the forest mold. And all our expectations in one wild-flower written dream. Confusion, and death-sweetness, and a thicket of crab-thorns! Heart of a hundred midnights, heart of the merciful morns. Perfumed airs, and thoughts of wonder. The vista of ten thousand years, flower-lighted and complete. There by the doors of old Fort Wayne. Autumn rains were the curtains, autumn leaves were the quilt.